Performance defines the equipment his company manufactures. Performance is what is driving the growth of his company. Performance is and has been the hallmark of the career of James J. Radous III. In his current role as President of UniCarriers Americas and Corporate/Executive Officer of Mitsubishi Logisnext Americas, James Radous has seen his company grow from the 8th to the 3rd largest producer of forklifts in the world. Among his many accomplishments, Jim has overseen a major brand change, while developing a corporate culture emphasizing teamwork and reliability. He has also guided the company through a major acquisition to Mitsubishi Heavy Industries, while overseeing a significant expansion of US manufacturing capabilities. Jim first joined UniCarriers in 2009 and served as Vice President, Sales & Marketing Operations and a Division Officer through 2013. In this role, he led the company through significant sales growth, a dramatic market share upswing, and delivering 4X profitability. As Executive VP of Americas-Sales and a UCA Board of Directors member from 2013-2016, Jim developed two new areas of revenue growth:  Business Development and Aftermarket. Helping drive UniCarriers into the top tier of manufacturers, he orchestrated multiple merger/acquisitions that drove up revenues by more than 30%. 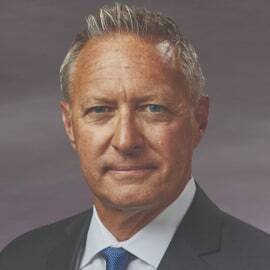 As President of Retail Operations from 2014 to 2016, Jim was selected to oversee the company’s first factory-owned dealerships, while complementing the company’s existing independent dealer network and strengthening its relationship with its dealer partners. Before UniCarriers, Jim played significant roles in sales and marketing at leading manufacturers, including:  Knaack LLC, a subsidiary of Emerson, as VP of Sales and a Division Officer; Klein Tools, as VP, Global Marketing; as Director of Sales & Marketing for Wen Products; and as Sales and Marketing Manager at The Chamberlain Group. As a member of the board of the Industrial Truck Association, Jim is helping to advance the interests of forklift manufacturers on Capitol Hill. As a former Chairman of National Forklift Safety Day, he worked to enlighten industry leaders, legislators and the media of the essential role of forklifts and forklift safety in business. Jim was IndustryWeek’s Manufacturing Leader of the Week in April of 2017. Jim earned an MBA in Marketing from Roosevelt University and BA in Communications from Northern Illinois University. As an alumnus, Jim mentors students from both universities and has provided several internships at UniCarriers. In 2017, Jim was invited to join the Walter E. Heller School of Business Advisory Board at Roosevelt University. In acknowledgment of his efforts, Jim was honored in 2017 as one of AARP Illinois-Crain’s Chicago Business 50@50+Illinois – a recognition of business leaders making a positive impact on their communities.